With the Research & Development ("R&D") Tax Credit now permanent and expanded, more and more businesses are taking full advantage of this valuable credit. As manufacturing continues to be a mainstay in the American economy, it’s crucial for owners and operators of these facilities to maximize the opportunity provided by the federal government (some states offer benefits too). Prior to being permanently extended in 2015, the research credit was a temporary code section that expired every couple of years. The uncertainty surrounding its fate created several tax planning issues for taxpayers. With these concerns now a thing of the past, manufacturers should take another look at their business and the potential for tax savings. 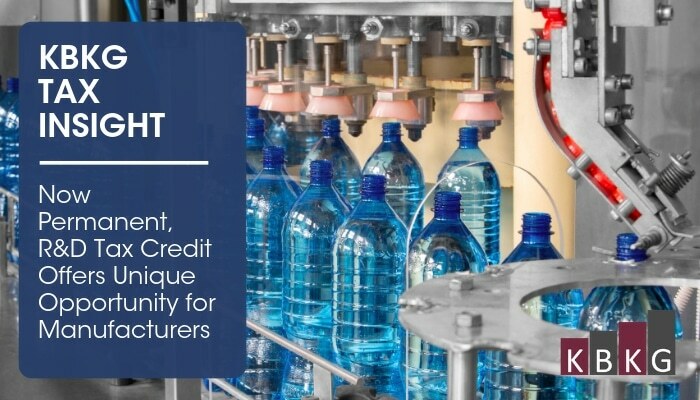 Companies involved with new product development, improving existing products or initiating process improvements to their production lines are prime candidates for the R&D credit. Generally, development efforts that include the following activities are likely to qualify for the credit. There are several phases in the manufacturing process that may qualify for R&D Tax Credits. Monetization has never been easier. Qualified small businesses may now apply the R&D Tax Credit against Alternative Minimum Tax (“AMT”). Additionally, qualified startup companies may elect to use up to $250,000 of R&D credits against their payroll taxes. The R&D Tax Credit is an often overlooked and misunderstood tax benefit. Most tax preparers only associate R&D with technology, biotechnology and pharmaceutical activities. Treasury regulations have substantially broadened the range of taxpayers eligible for the credit. As a result, more companies can take advantage of these benefits. It is undeniable that there is a unique opportunity for manufacturing businesses, large and small that conduct qualifying research, to take advantage of this credit. Estimate the benefits and get more information.